This is our girl Marvelous AKA Marvel. She is the joy of Our Lives when she's not chewing on something questionable LOL! I am a customer of Katie's hairstyle business and frequently spoke with her about my husband's dream for owning a husky since she is a husky breeder. Around Christmas of 2016 , I contacted Katie ready to take the plunge. Originally Marvel was meant to be my husband's Christmas present, but she quickly made it clear that she was not a one-person dog. She's not even a one-dog dog. She loves everybody and wants to make new friends daily. My husband has always wanted to show Huskies, so a dog from Katie's with such an impeccable background and perfect physical features was our ticket. We still have much more showing we plan to do, but with her beauty and heightened intelligence she has proven herself willing to work with us. Not only did she take training classes seriously, quickly learning the basics and advanced stuff, she keeps on learning new things. 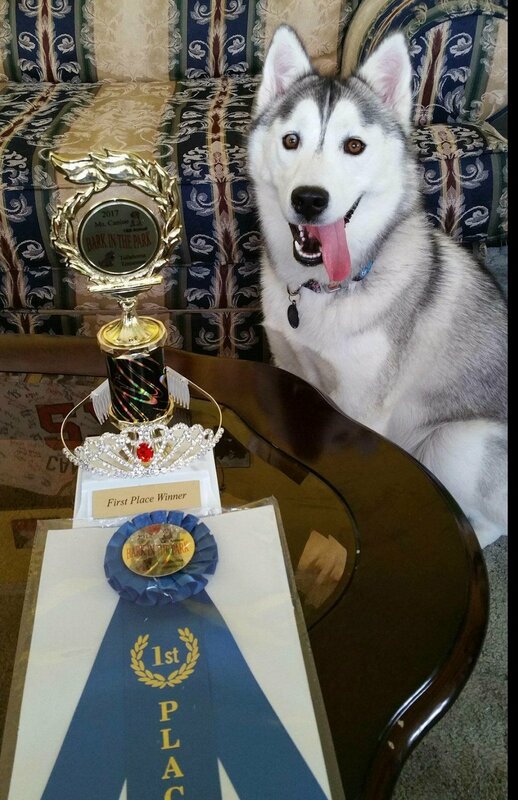 In October of 2017, Marvel was shown in the Tullahoma dog show and won two separate events. The second one named her Miss Tullahoma Canine which earned her a great deal of infamy as well as a ride in the Tullahoma Christmas parade. We're really proud of our girl and super thankful to Katie for helping us with the harder parts of her early months as we got used to each other. She always had answers and advice. Marvel is a wonderful dog. We highly recommend Skudder's Siberians to anyone looking for an exemplary Siberian Husky.